Ram Promaster Forum > Ram Promaster General Discussion > Promaster General Discussion Forum > Device to lock rear doors open 90 degrees? Device to lock rear doors open 90 degrees? Idle thinking alert! Wondering if someone has seen or come up with a device that will lock the rear doors open 90 degrees. In other words, straight back. I can't remember exactly which van, but I thought I saw something like this from a different make (Nissan NV2500?). I could find this useful for a number of reasons. Doors not swinging in the wind or due to a slope, etc. If the door is fixed in this position, I could rig some steps that could fold out from the doors to help me climb up on the roof (solar panel cleaning). I warned you, this was idle thinking at play! I recall a member having a cable-based "stop" that would prevent the doors swing *greater* than 90 degrees, but I don't think it'd prevent it swing back closed. Sprinter has a retractable bar that does that. You might borrow from their design. I rigged something up, crude but it works. Eye bolt thru existing holes in the upper corner of each door. 2 tubes/pipes/dowels that connects the eye bolts to the upper center latch bars. 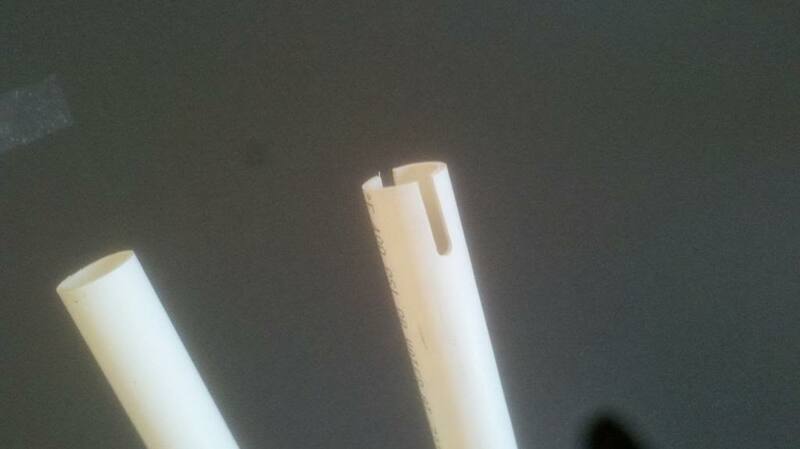 The tubes have approx 45° cut on the ends and a hole drilled thru each end. By inserting a retaining pin thru each hole and thru the latch bar/eye bolt it will hold the doors open. If you reduce the opening to say 80°-85° you allow traffic behind you to see your tail lights, why? so I can can load long lengths on wood at the store and drive home. I can do 14 footer in my 1500. Are you planning on driving with them open, for really long material (hense the 90 degree desire and no more? ), or is this more for wind protection when doors are open? this is a strength of the NV and Transit over the PM for conversion, they both have keeper arms that stop the doors at 90 (ish) then you slid a lever and can open them up all the way around to magnetic locks that hold the doors in place. As for a mod for the PM i think the easiest, cheapest and most effect would be a bar that rest across the top of the doors, some channels that slide over the metal. Could pad the channel so it doesn't scratch the doors. Having a ladder is indeed helpful for other things. I just wanted a quick and dirty (possibly slightly dangerous) way of getting up on the roof easily. I've seen a video where someone simply goes up on their platform bed above the garage area, put one foot on the upper hinge of the passenger side rear door and clambers up that way. A little risky and so I thought I'd think of a similar way but with a better toe hold. I've seen those ladders. Do you feel 10.5 ft is good enough. I've seen a 12.5 but it's bigger and harder to store. (The 10.5 can fit onto one of the rear doors and if you have windows, it doesn't even impede the view. Nice, Phil; that will work. the one i have is actually an 8' when extended.. if im remembering rightly. Compacts down under 30". Its been great for everything i do: project or getting up on top of the bus (now van.) The only advantage i see to going taller in relation to a van is you can have it extend up over the top (but you would want to pad the area you are leaning against *where as leaning it jsut below the roof height, you can make use of the rubber top of the ladder*), which is proper ladder safety, but i've found mine to work jsut fine. Here is another idea for steps to attach to door or anything else, jsut set them into something stouter than the sheet metal, may have to install a 2x6 or something the set to. note on those telescoping ladders, you can extend them out to any length (full extend each rung individually), up to the maximum height. kinda nice for shorter work. Thanks, that Grainger part could help me clamber onto the roof without using the hinge.